Like any other gift, the gift of grace can be yours only if you’ll reach out and take it. Frederick Buechner. Guys, I love a good quote. When I was a kid, I had quotes stuck all over my wall. Some were pretty, but most of them were just scribbled lines on note paper. But they meant the world to me and filled me up whenever I read them. I want to share a couple with you that have not only encouraged me but have challenged and changed me, too. I’d love to hear what quotes are meaningful to you? What words are up on your walls? Which authors have written lines that have reached down into your soul? Not just the ones that make your heart warm, but the ones that make you think, maybe even cringe, and stay with you long after you’ve read them. Email them to hello@pktfuel.com, or head to our website pktfuel.com and let me know! “The grace of God means something like: Here is your life. You might never have been, but you are because the party wouldn’t have been complete without you. Here is the world. 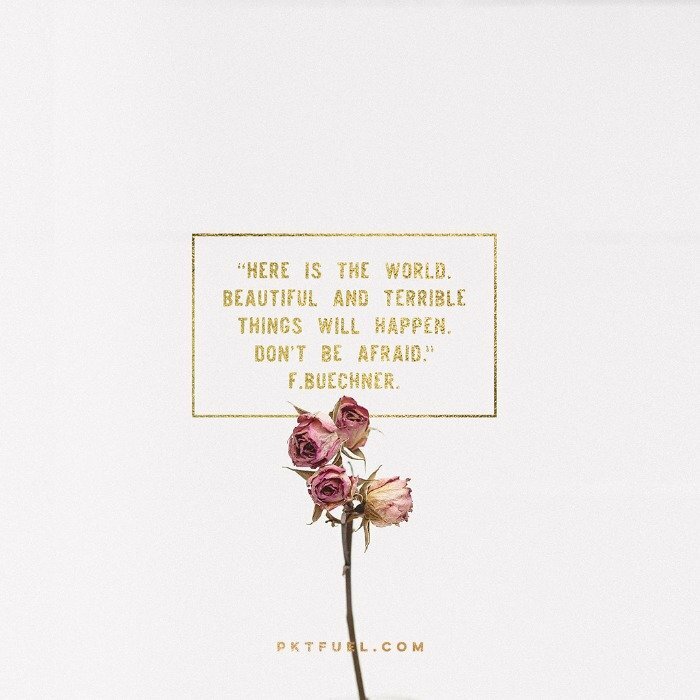 Beautiful and terrible things will happen. Don’t be afraid. I am with you. Nothing can ever separate us. It’s for you I created the universe. I love you. There’s only one catch. Like any other gift, the gift of grace can be yours only if you’ll reach out and take it. Maybe being able to reach out and take it is a gift too.” Frederick Buechner (1). This quote messes me up something fierce. It’s my all-time favorite, and it’s written on a chalkboard that hangs right by my front door. The faith of my childhood was more than sheltered. I had vague ideas about poverty and war… But racism? Misogyny? Inequality? Domestic Violence? Sexual abuse? Refugees? Clueless. I thought the government was good and that church was where everyone needed to be. I remember in my late teens becoming aware of the world, feeling like I had been asleep for years. If God was so good, why was the world so bad? Was it all the devil? Should we pray more and have more services and sing more songs? Would that fix everything? I began to see the complexities around good and evil, how it's rarely black and white. I realized that within myself I had the potential for both light and darkness. And if I had that potential, what about everyone else? And finally, even though grace is a gift, I’ve learned to reach out and take it. Because if I don’t, it will always be out of reach. Friend, stop waiting for others to validate you, tell you that you belong, include you, and deem you worthy. Take the gift yourself. Receive it. Own it. Live it. (1). Frederick Buechner. Listening to Your Life: Daily Meditations with Frederick Buechner (p. 289). HarperCollins. I was reading that and I had to stop and ask “how did you know?” haha. How did you know that’s exactly what I’ve been struggling with the last few days. It felt like God speaking directly to my heart in those few words. I always get so much out of reading your devotionals. Thank you! Zack! We so loved reading your comment. It is truly humbling that you get so much meaning from our writing. Thank you for reading.